A view of renovations at the Emerson Colonial Theatre in April. Before a support beam for a steel grid above the stage failed over the weekend, the theater was scheduled to reopen in late June. A construction mishap occurred over the weekend at the Emerson Colonial Theatre when a beam that supports a new steel grid above the stage failed, raising the question of whether the world premiere of “Moulin Rouge! The Musical’’ might be delayed. The grid in question is a support structure that holds the rigging system for scenery, lighting, and other production equipment. “It has nothing to do with the infrastructure of the Colonial,’’ Jones said. Consisting of ropes, pulleys, blocks, and counterweights, the rigging system enables stage crews to deploy the technical components of a production. 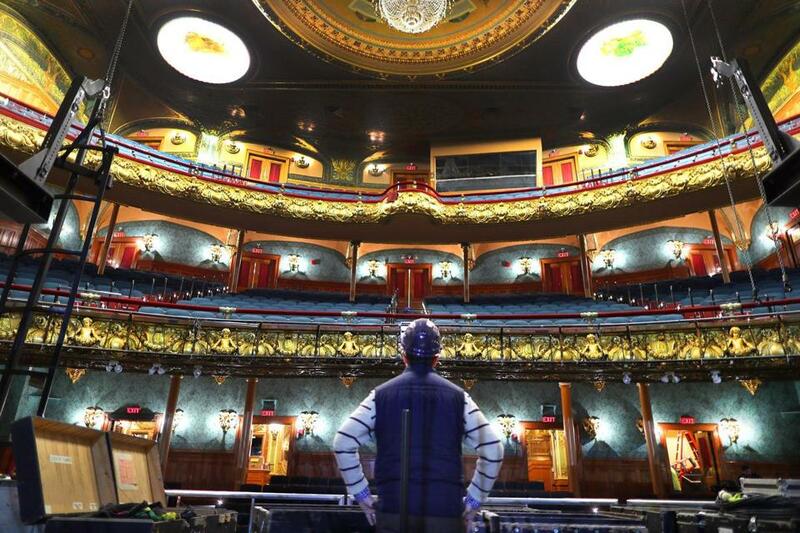 The Colonial, which has been dark for nearly three years, is nearing completion of extensive renovations that are designed to restore the storied theater’s role as a prime showcase of major productions, including shows with Broadway aspirations. “Moulin Rouge!’’ is to be the first such production at the refurbished Colonial, with performances scheduled to begin on June 27 and run through Aug. 19. Don Aucoin can be reached at aucoin@globe.com. Follow him on Twitter@GlobeAucoin.